With a little under three minutes remaining in the first half of Michigan’s 66-59 victory over NC State, Derrick Walton came down awkwardly on his left foot, and the Michigan basketball fan base let out a collective gasp. 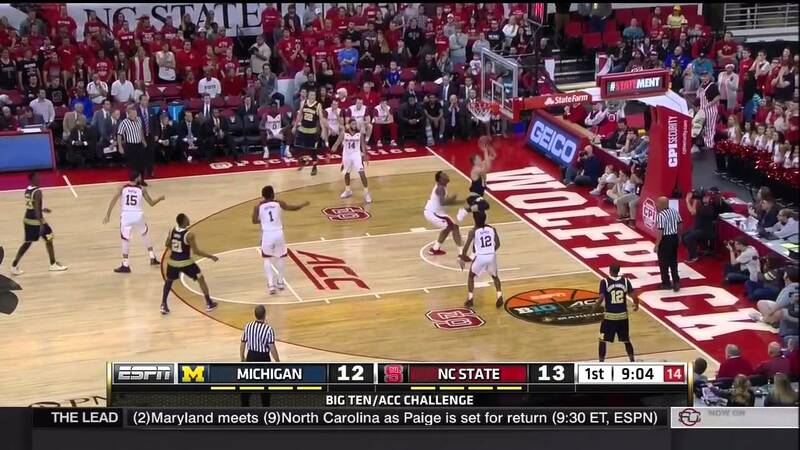 RALEIGH, N.C. — With a little under three minutes remaining in the first half of Michigan’s 66-59 victory over NC State, Derrick Walton came down awkwardly on his left foot, and the Michigan basketball fan base let out a collective gasp. That’s the same foot that plagued the point guard throughout last season. It remains unclear whether or not Walton will have to miss time due to the injury (John Beilein called it a “slight ankle sprain”). But judging by his pained facial expression on the bench immediately after he was taken out, it was clear the Detroit native likely wouldn’t be back to finish off the game. In Michigan’s first true road game, with backup point guard Spike Albrecht still fighting his way back from offseason surgery, the Wolverines needed someone to step up. At halftime, John Beilein called on Caris LeVert to take over at point guard. And his teammates did the rest. “Coach came to me and told me I was going to be the lead guard in the second half. Derrick’s our brother out there so we wanted to get the win for him. He played so well in the first half offensively and defensively. We knew we had to play well to win the game,” LeVert said during the press conference after the game. “When you got guys like Duncan and Moe (Wagner) who can really shoot and finish like that, it’s easy to get seven assists,” he said. It’s true. Two of LeVert’s assists came after Duncan Robinson nailed 3-pointers. The Williams College transfer was huge in Michigan’s win, going 5-for-7 from beyond the arc. Robinson was instrumental both in extending Michigan’s lead in the first half – which they defended effectively all game – and in putting the game away; he and Zak Irvin hit back-to-back triples with under seven minutes remaining to make a Wolfpack comeback nearly impossible. Beilein identified Robinson as one of the Wolverines who has most improved since Michigan’s two dispiriting losses to Xavier and Connecticut earlier this season. Robinson wasn’t the only player who stepped up to help LeVert lead Michigan to a tough win on Tuesday night. Freshman big man Moritz Wagner continued his recent stretch of strong play – further solidifying him as Michigan’s best option in the paint. Muhammad-Ali Abdur-Rahkman also gave Michigan a boost off the bench as he shared the backcourt with LeVert. The sophomore guard stuck to NC State point guard Cat Barber throughout the final 20 minutes and rendered him ineffective. It remains to be seen how many games Walton will be out, if any, because of his ankle injury. And Michigan still has a long way to go on the defensive end despite NC State’s poor shooting (33 percent for the game). But when Michigan was looking for players other than LeVert to step up and beat a tough team on the road, it found them. This team might not have an identity yet, but it’s getting closer.